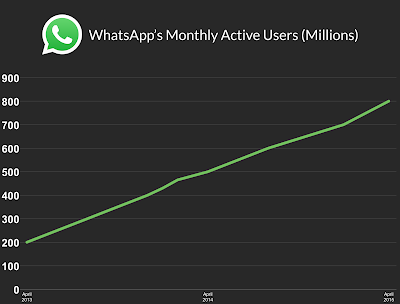 This statistic shows a timeline with the amount of monthly active WhatsApp users worldwide as of April 2015. As of that month, the mobile messaging app announced more than 800 million monthly active users, up from over 700 million in January 2015. The service is one of the most popular mobile apps worldwide. WhatsApp is a free to download messenger app for smartphones. WhatsApp uses the internet to send messages, images, audio or video. The service is very similar to text messaging services however, because WhatsApp uses the internet to send messages, the cost of using WhatsApp is significantly less than texting. It is popular with teenagers because of features like group chatting, voice messages and location sharing.